While this game that I'm about to review is nearly a year old, I just got into it as I'm slowly but surely checking off games on my backlog. It's Camelot's latest RPG, Golden Sun: Dark Dawn for the Nintendo DS. Let's see how it fares, shall we? Camelot might not be owned by Nintendo, but they are a great asset to the company nonetheless. The company has given the big N several Mario sports titles like golf and tennis, created their own Wii-exclusive golf franchise in We Love Golf, and of course, crafted a finely-woven RPG in the Golden Sun series. It's been a long seven years since our last encounter with the popular franchise, so does the sun still shine brightly for it? Alchemy was sealed away by powerful mystics. However, they soon found out that the world of Weyard needed Alchemy in order to thrive and survive. It's been thirty years since the lighting of the four elemental lighthouses and since the Golden Sun shun like a beacon in the heavens. Alchemy has been restored, but not without consequence. Earthquakes and tornadoes ravage the land. Two of the Warriors of Vale who brought back Alchemy now live on Mt. Aleph with their children. There's Matthew, the strong, silent type, son of Issac, Tyrell, son of Garet, and Karis, daughter of Ivan. All is well until the three heroes embark on a quest of their own with manipulators in the background pulling the strings. Their (the villains', that is) purpose is to bring forth a dark dawn that will summon the vilest monsters imaginable to the continents and cities of Weyard. It's the goal of Matthew and his merry party to put an end to the villains' plot and restore order and balance to the world. 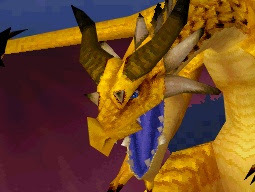 The game features gibberish for voice acting, and all cutscenes are performed in-game. The story is easy to pick up on even for those who did not play the previous two Golden Sun titles as there's an encyclopedia for new names and places. When one of these is brought up mid-conversation, a player can tap the underlined word or use the shoulder buttons to switch between important terms to learn more about them. Sometimes there's simply too much story which slows the pacing down to a halt. You just wish for the characters to use some brevity for once. Other than that, the story is an entertaining one that will grip players from beginning to end, even if there's a cliffhanger to worry about. Dark Dawn is not your typical JRPG. Yes, your party (which eventually grows to eight members) earn experience and earn levels and new spells accordingly through random encounters, but some magic, or as it's known in the Golden Sun universe as Psyenergy, can be used outside of battle to solve puzzles. For instance, certain objects that stand in the way and cannot be moved where Matthew is standing can be pushed out of the way from a distance using the Move Psynergy. Growth can sprout a vine from a budding sapling, Douse can fill pools of water, Whirlwind can blow gusts of wind at certain platforms which allow them to float for a limited amount of time, and Crush can break apart large rocks that are otherwise impenetrable to pass. Psyenergy can also be used in battle to take down groups of enemies or heal the party from status ailments or heal a party member's hit points. Items like Psy Crystals can regenerate lost PP (Psyenergy Points) quickly, or players can opt to walk around the dungeons, towns, and world map to have it slowly recover. To aid players in battle, there's collectible Djinn hidden all around Dark Dawn. They come in four varieties: Venus (earth), Mars (fire), Jupiter (wind), and Mercury (water). Some are easy to spot but need to be fought to be coerced into joining your side while others need some mad sleuthing skills to discover. They can be in specific locations on the world map, placed in precarious locations where players will be forced to use their Psyenergy to uncover, or holed up in optional caverns and dungeons. When a Djinni (the singular form of the word Djinn) is gathered, it's assigned to one of the members of the player's party. Djinn must be distributed evenly among party members, so one party member can't hold eight Djinn while the others only hold two or three. Djinn act as status boosters, giving party members more health, PP, attack strength, defense, speed, and so forth. Additionally, they can be used in combat giving off different attacks or abilities. One might lower a foe's defense or agility while another raises the party's attack. Djinn that are used in fights go to Standby mode. This allows a party member to summon some gnarly beasts with immense power. For instance, having four Venus Djinn on Standby allows a party member to summon Judgment, a mythical monstrosity with a lion's mane for an arm which, when it opens its mouth, shoots a bodacious blast at all enemies on screen. Summons are the most graphically impressive portion of Dark Dawn, and if you grow tired of viewing them, you can always fast-forward through them unlike some RPGs which shall remain nameless (Final Fantasy VII). Once your Djinn are off Standby mode they enter a Recovery period where they rejuvenate their powers before once again being equipped to your party member. 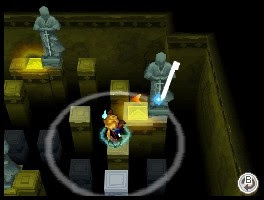 Summons can not only be collected through gathering Djinn, but they can be found hidden in out-of-the-way caverns and dungeons. The most powerful summons await players in post-game areas with omnipotent bosses guarding them. These are more for 100% completion than anything else as having beaten the most difficult bosses in the game, what else is left to do with the summons than utilize them on foe fodder? Weapons, too, can house abilities. When a character uses a weapon repeatedly, their skill with it improves. This allows them to learn critical hit techniques that can damage a swath of enemies rather than individual ones. There's a multitude of weaponry available including swords, rapiers, axes, bows, staffs, knuckles, and much more. Depending on which character you select, that person can only equip a specific line of weapons. 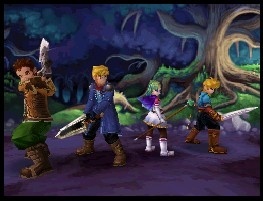 Battles in Golden Sun: Dark Dawn are turn-based. Characters and monsters take turns attacking, defending, using Psyenergy, utilizing Djinn, or summoning monsters. Most encounters are on the easy side as Dark Dawn is a pretty simple game to complete. On rare happenings players will have trouble with the occasional boss battle, but otherwise Dark Dawn can be beaten quite easily. In my experience with the game, I only had to grind for the final boss. Sure, I had to grind fifteen levels just to stand a chance and had no problems up until that point, but the enemies gave an ample amount of experience (in the 40,000s each battle). The optional bosses that pop up after the game has been finished off and game data has been saved (by the way, players can save the game anywhere) are grueling tests for even the most seasoned RPG athlete. Bosses can kill in one hit, make multiple attacks per turn, and summon friends to fight alongside them. Besides the lax difficulty, the most grandiose problem I have with Dark Dawn is the concept of being able to permanently miss out on certain Djinn, summons, and items with no warning as to when these "points of no return" will occur. For completionists like myself, a guide was a necessity to find everything the game had to offer without missing anything. There's approximately seventy different Djinn to collect, multiple summons, and a gaggle of good items that can be cast to the wayside unintentionally. This is infuriating to know a player missed something, and if they're a completionist like myself, they'll probably want to restart the game to gather everything. 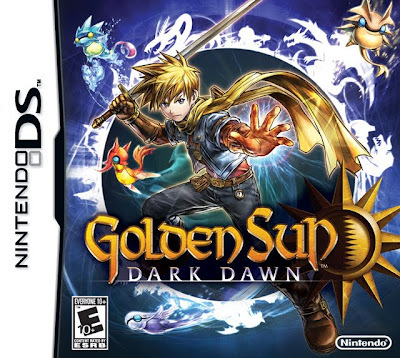 Visually, Dark Dawn throws away the 2D sprites of the past two Golden Suns and replaces them with chibi-styled 3D models as well as 3D objects, buildings, and backgrounds. The models don't look quite as sharp as their 2D counterparts, but for Nintendo DS graphics they aren't too shabby. It's inside battles where the visuals really shine. Character models look great, enemies are daunting and look pleasant, and the summons especially look intimidating as well as awesomely cool as they take up both screens in all their ominous glory. The soundtrack is composed by vet Motoi Sakuraba who is best known for his work on the Star Ocean and Tales of franchises. Whenever there's a Camelot game that needs music, Sakuraba-san is usually their man. The score isn't his best, but it fits the mood of the various towns, dungeons, and areas of the game-- even if it's his worst Golden Sun soundtrack to date. 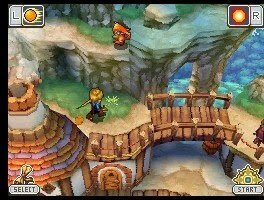 Ultimately, Golden Sun: Dark Dawn is a competent RPG on a platform where RPGs are a dime a dozen. What makes Dark Dawn stand out are the terrific localization and the clever puzzles whether they be log-rolling, chasm-jumping, pillar-pushing, or whatever else. The game might be overly simple when challenge is concerned, and the points of no return may be a pain in the you-know-what, but for a game that can easily be completed in under 25 hours, Golden Sun: Dark Dawn shines rather brightly.